A royal wedding brings out the oddball side in Brits, and this of course includes splashing out on some seriously unusual commemorative items. Now, I’m not just talking about those collectible Lady Di tea cups gathering dust in your nan’s best cabinet. The impending nuptials of Prince Harry and Meghan Markle have inspired products as diverse and seemingly unrelated as pork sausages, dog neckerchiefs and condoms. 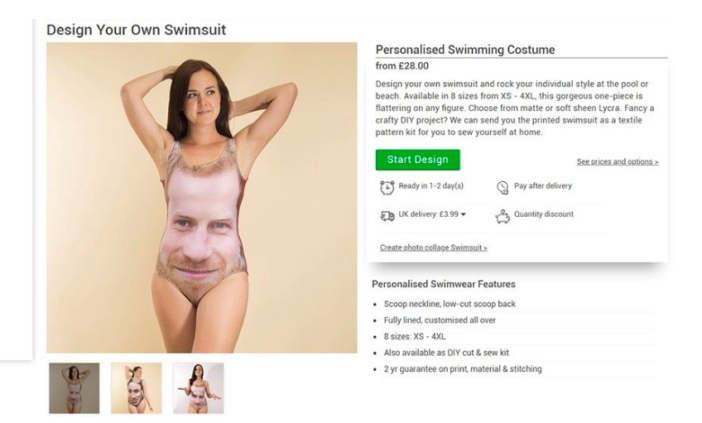 And for those commoners who really want to show their adoration for the regal couple, there is always a swimsuit bearing the face of either Harry or Meghan. 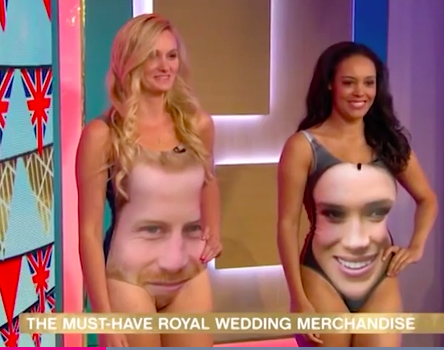 These swimsuits were paraded by models during a royal memorabilia segment on This Morning, but were not greeted with the veneration usually afforded to the image of a possible future King. Phillip Schofield and Holly Willoughby could not stifle their sniggers at the unfortunate placement of Harry’s bearded chin; positioned directly on the model’s crotch. Indeed, Harry’s ginger stubble looked uncannily like pubic hair. The Harry one is all wrong! It’s the beard. It’s where the beard is that isn’t right. Oh no! What the hell were they thinking?! They should have just moved his face up a bit. Other regal items demonstrated included Mr Kipling cakes, champagne and biscuits. But none could top this hilariously rude swimsuit. Viewers watching from their own respective palaces shared Phillip’s mix of mirth and bewilderment. Megan should buy one of those swimsuits for the honeymoon just for the craic #thismorning that was hilarious the millions you can make from old tat is mental. Swimsuit demo on @thismorning I’m crying laughing, true meaning of a hairy ginger! Hilarious beard placement on the lower end of the pants! So funny! @thismorning don’t show me the Harry swimsuit when I’m ironing. I gaffawed and nearly burnt my fingers! 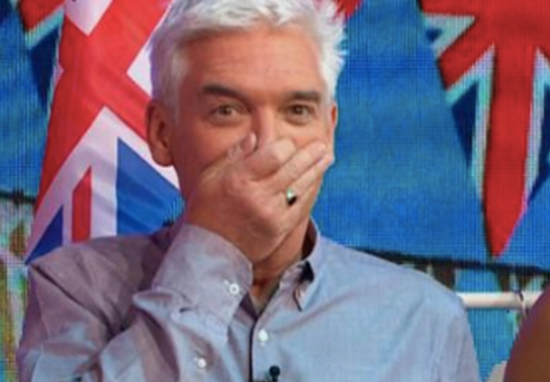 @thismorning @Schofe making me nearly spit my drink out laughing at those swimsuits ? The royal wedding is nearly upon us, and although I’m sure this isn’t part of the official dress code, you can wear one of these swimsuits to your heart’s content outside of the palace grounds. Costing just £28.00 from Bags of Love, demand has gone through the roof as wedding fever takes hold. Nothing like printing the face of a Prince or Duchess on a swimming costume and rocking it proudly on the beach. Based here, in London, we fully support [the] royal heir. We also believe our choice of placement [for] Harry’s beard reflects our thoughts on accepting the body too, on accepting who you are. Swimsuits with the faces of Kate Middleton, Prince William and Queen Elizabeth II are also reportedly available for purchase, for those who want to feel like royalty every day of their holiday.